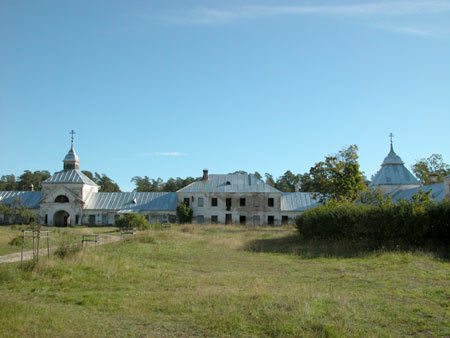 Let's start our visit to the main sight on the Konevets island: the Konevets Birth of Holy Mother of God monastery. 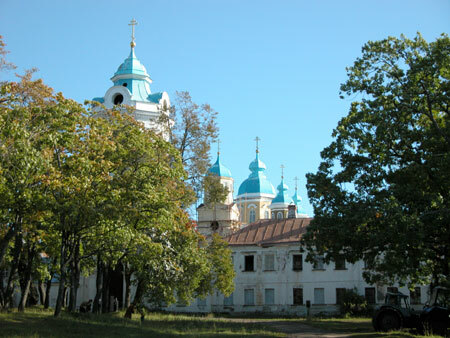 The monastery is built in a traditional configuration: as a wall surrounding the Cathedral. The interior is accessible through two entrances: one on the lake-shore side, though which we are about to enter, and another, a back entrance, on the forest side. 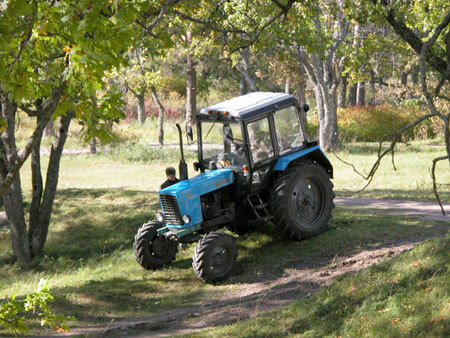 In front of the monastery - a Belarus tractor of a recent vintage. 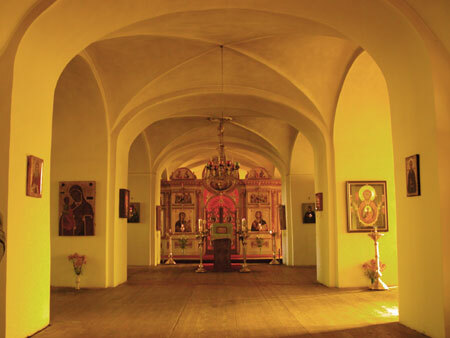 This is the chapel, through which we will enter the territory of the monastery. 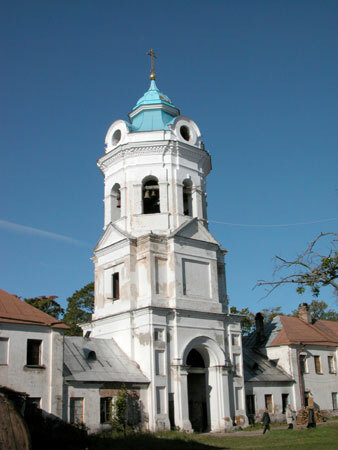 The chapel is 35 meters high (to the cross). To the left and right of the chapel are buildings from 1808-1810. The small, single-story section to the left of the chapel used to house the porter and the sexton. The similar single-story section on the right used to contain the vegetable store. The main two-story buildings that surround the Cathedral included the prior's chambers, the monks' cells, waiting rooms, the archive, the dining hall, and the bakery. 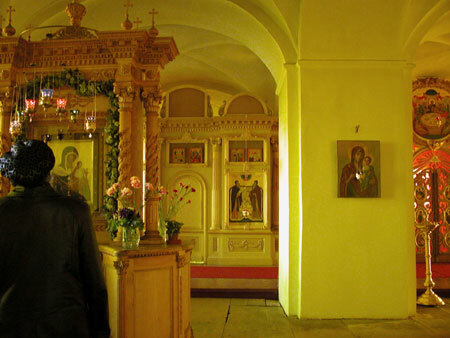 Now we are inside the monastery, i.e. on the other side of the chapel. 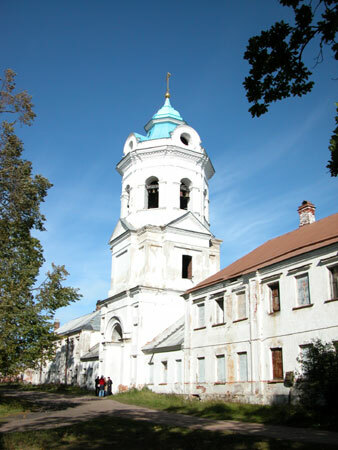 The monastery was founded at the end of the 14-th century. 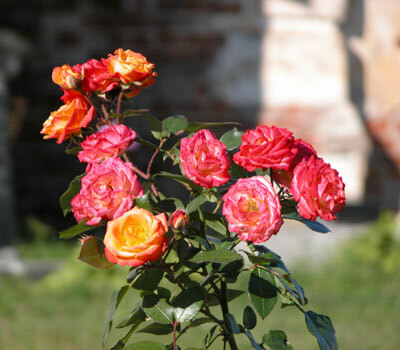 At first, in 1398, the foundation was laid for a church on the lake shore. But due to the flood danger the monastery itself was built here, on higher ground. In 1577 and from 1610 until the end of the Northern War, the island was occupied by the Swedes. 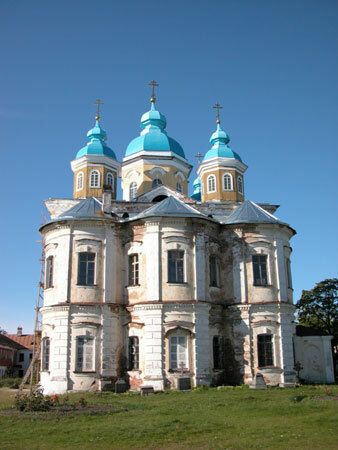 At that time the monks had moved to a monastery near the Great Novgorod. After the October 1917 revolution the island ended up as part of Finland. 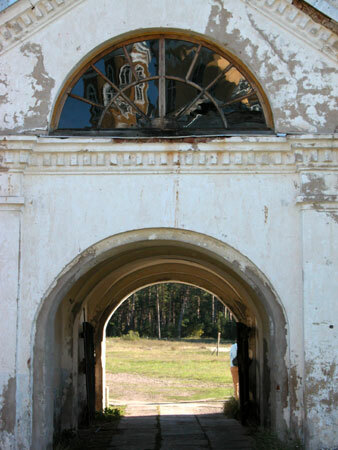 Prior to the Soviet-Finish War of 1939 the island was home to headquarters and two batteries of Finish shore artillery. 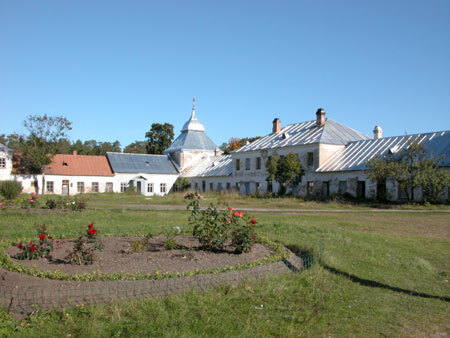 The buildings that remain on the island date from the 19th and beginning of the 20th century. 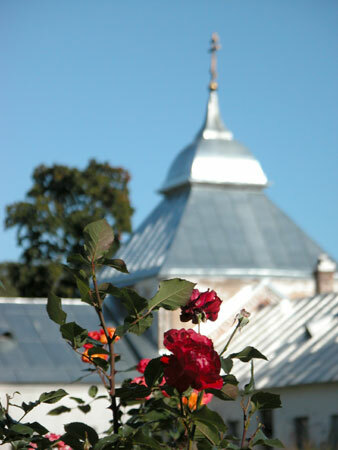 At the center of the monastery is the large Cathedral of the Birth of the Holy Mother of God; its cupolas appeared in one of the prior photos. 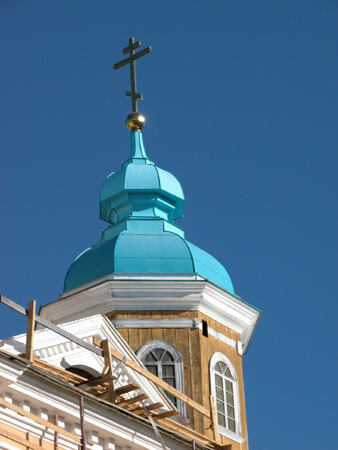 The building was erected on the foundation of older churches, i.e. on the same spot. 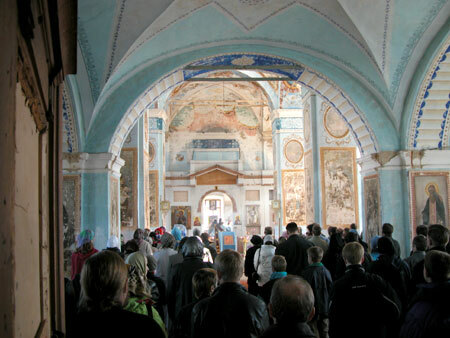 The first stone cathedral was built here during the reign of Ivan the Terrible. 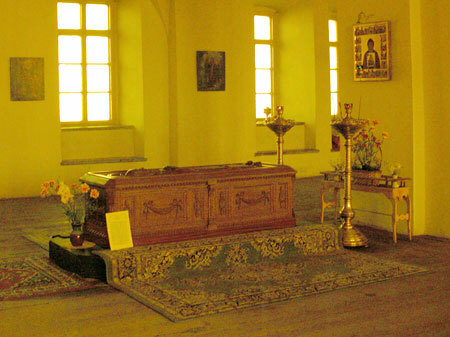 I believe these are the relics of Arsenii Konevsky, the founder of the monastery. The Cathedral has two stories, but there was almost no one on the first floor. 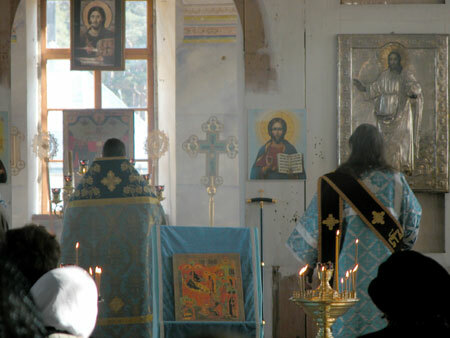 On the second floor there was a service marking a religious holiday. Not much of our 'civilization' has reached the island; the monks are a picturesque bunch. They do not require that you to get a blessing (for a fee) to take the photos; rather they take no note of the camera at all. 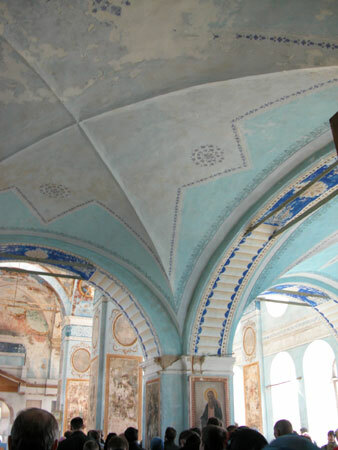 Frescos are in the process of being restored. Here is a view behind the Cathedral. 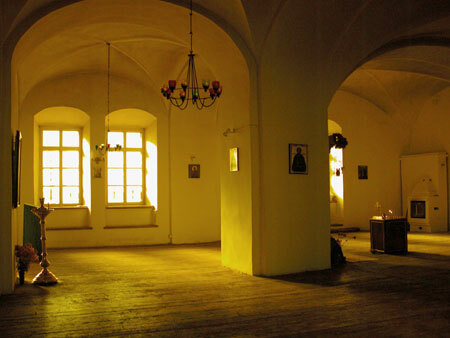 The two story buildings contained the monks' cells. The one story buildings next to them had the workshops. Nearby is a well attended flower bed. 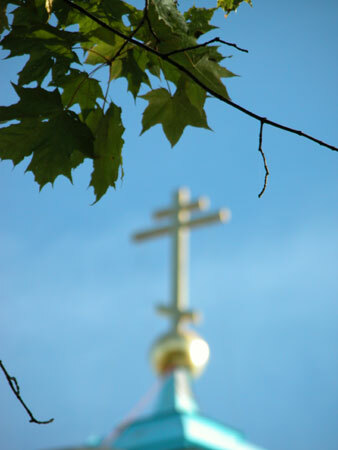 Interestingly, there are crosses at the tops of these towers, while at the Yur'evsky and the Iversky monasteries the towers (aside from the Cathedrals) have different figures. The building, like the surrounding walls, was erected in 1874 by the architect I. B. Slupsky. 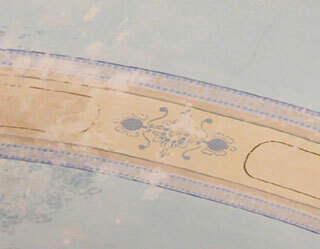 The side turrets really are wooden; the central turret may also be, but it is sheathed in plaster. 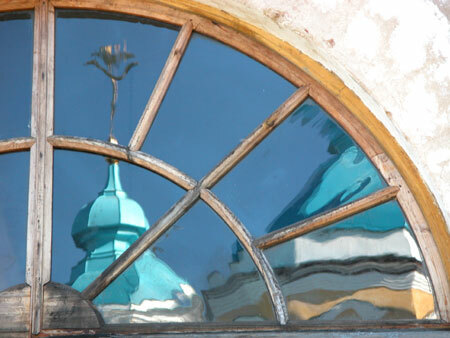 A reflection of the Cathedral in the gate's windows. 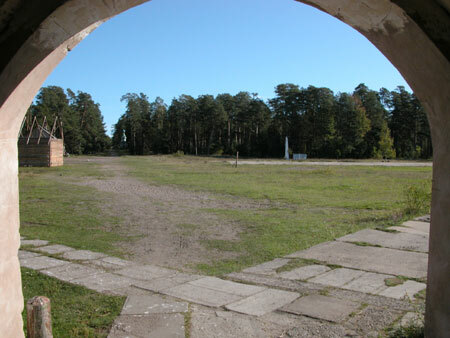 In the next album we will walk under this arch to see the monastery's backyard, as well as the Uspensky chapel, its turret seen straight ahead by the woods.